I always have been ambivalent about New Years celebrations as an adult. Part of me wants to go out and party, but that is something I don’t really like to do alone, and being at a raucous party alone on NYE makes me feel extra lonely. I have been lucky that since I graduated from university in 1998, 13 out of the last 15 New Years Eve have been spent overseas. You would think that I would have amazing experiences in foreign countries, and there have been some fun ones (which will be addressed in a future post), but for the most part, I’ve celebrated NYE alone and in my room drinking (it’s really not as sad and pathetic as it sounds). But I am always on the lookout for something new and different. In the spirit of that, I searched all over the Internet to see what sort of NYE activities Seoul offers. Not surprisingly, there were a number of clubs and parties, but that just wasn’t what I wanted to do. During that search, I stumbled upon the concept of sunrise festivals. While the stroke of midnight is widely celebrated in Korea just like in the rest of the world, there is also a special emphasis on experiencing the first sunrise of the new year. 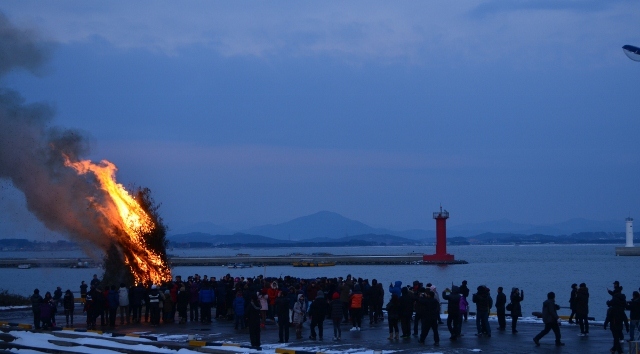 Understandably, most of the sunrise festivals occur on Korea’s east coast and the island of Jeju-do, since that part of Korea is the first to see the sunrise. However, there is one festival at a place called Maryang-ri near the town of Seocheon. It’s located on the west coast about a three hour train ride south of Seoul. For 60 days surrounding December 22, the sun rises and sets in the same location, which has made this a popular spot for a sunrise festival. The festival begins right before sunset with a ceremonial drumming performance and enjoying the last sunset of the current year. This particular sunset was rife with beautiful cloud formations and intense colors. 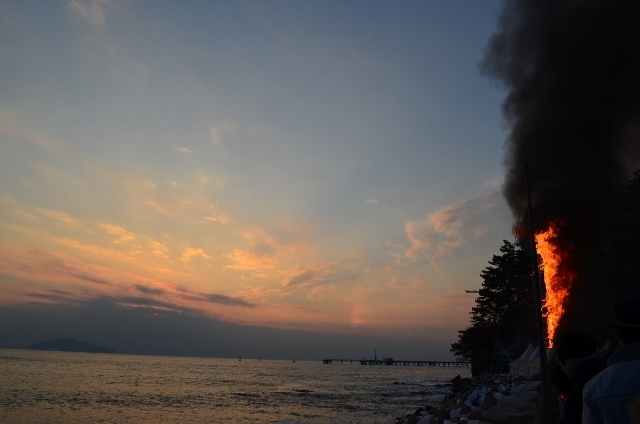 Once the sun set, there was an array of musical performances up until midnight, while several bonfires were lit around the port. The bonfires provided warmth and heat, and also a sense of community. Around the bonfires, family and friends congregate, keep warm and grill up a variety of foods, such as rice cakes, chestnuts and sweet potatoes. I don’t speak Korean, and I’m very introverted, so I didn’t make much attempt at conversation, but rather just observed the activities going on around me. However as a Western woman traveling alone, I was treated as somewhat of an odd duck (other experiences as a woman traveling solo will also be explored in a future post). There was much astonishment at the fact that I was a woman alone, and I heard the terms “brave” and “dragon” more than once. In a country where solitary activity is not very common, particularly among females, it made me stand out even more, but not in a bad way. I find the Korean people are very generous and love to share, particularly their food and beverages. So I got to experience a never ending supply of treats and sparklers that evening. I usually love long, cold winter nights, but you get a different perspective when you are outside from sunset until midnight, and then midnight until sunrise. There was approximately six and a half hours from sunset to the stroke of midnight and that is plenty of time to enjoy the bonfires, listen to the music, take in the near full moon, all under a very cold winter’s night. Once midnight struck, there was the typical jubilation (though not the mass of kissing you see at some western NYE parties) and celebration with fireworks. What was interesting was what to do with myself after midnight. Sunrise wasn’t until 7:44 am, so that is nearly eight hours of time to kill. Thankfully I brought some reading material to help pass the time. For future sunrise festivals, I will be sure to go to one with a hotel room nearby, so I can go to sleep and stay warm. As it was, there were still people like me who traveled via public transportation and elected to stay until sunrise, and also had no place to go. Movies were played on the large screen, bonfires were kept active, and the food vendors were still selling their wares. Thankfully there were also large space heaters in tents, but they were partially offset by the growing chilly breeze and ensuing snowfall. When the sun set, it was clear and cold, and I anticipated an equally cold and clear sunrise, but Mother Nature had other plans. It started snowing around 2 am, and at first it was just flurries. But as sunrise approached, the snow came down harder and harder, and with the blowing wind, it felt like it was pouring snow instead of rain. Then the time came to shuffle from our tents and heaters to take in the majesty of a winter’s morn on this first sunrise of the new year. Amazingly enough, the snow stopped right as official sunrise hit. Since this was a sunrise festival, there was another countdown to sunrise culminating in a massive balloon release to celebrate the dawning of a new day in a new year. 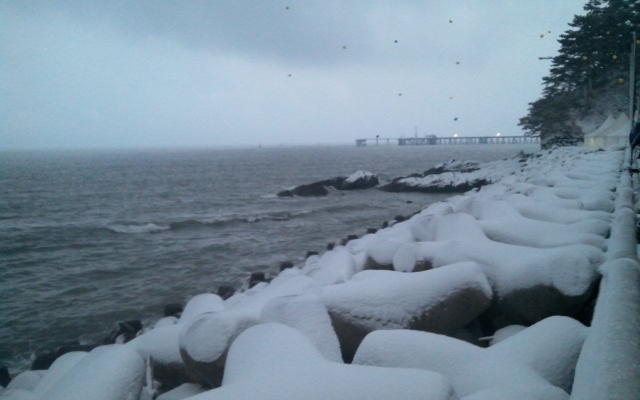 While the sunrise wasn’t nearly as colorful as the sunset, the growing light was welcome upon the new fallen snow and the calm sea. I will admit to being cold, wet and tired by the end of it, and I felt I rushed through the appreciation of the sunrise. But it still was a different sort of New Years celebration. I very much enjoy communing with nature, and this festival is a way for me to appreciate the beauty of this world and the beauty of a new year, without the pain of a massive hangover. 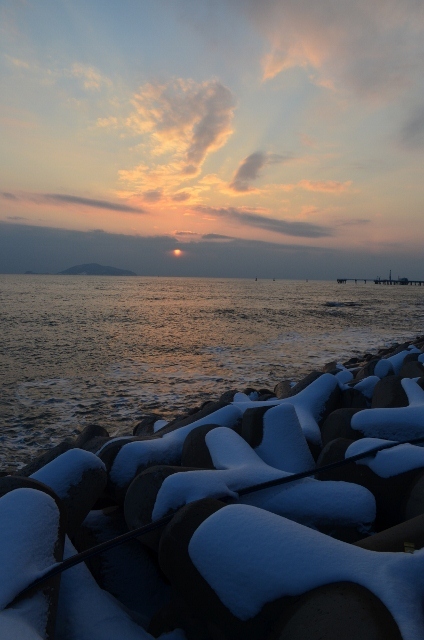 This entry was posted in Travel and tagged 2013, Korea, New Year's Eve, Seocheon, sunrise festival.